Taipei, Taiwan －June 5th , 2018－Thermaltake today officially released the long-awaited Level 20 Full Tower Chassis and Level 20 GT RGB Full Tower Chassis at the Thermaltake Opening Press Conference at COMPUTEX Taipei 2018. 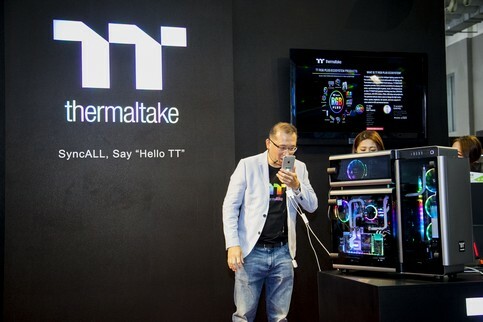 Thermaltake CEO & Chairman, Kenny Lin, also unveiled the TT RGB PLUS Ecosystem, and demonstrated the TT AI Voice Control function. 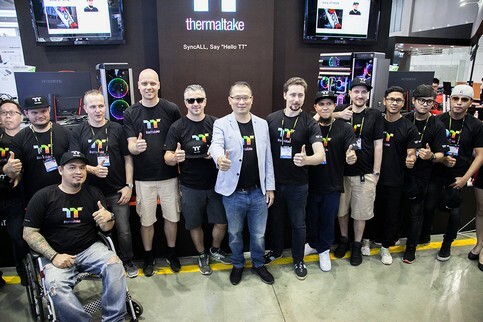 Thermaltake invited 12 top modders from the Thermaltake Modding Fighting Championship and the CaseMOD Invitationals to display their masterpieces: Alex, Mike Peteryns, Chaipoj, Erik, Mathieu, Michael, Mhike, Tim, Peter, Siwasak, Suchao, and Jesse. Thermaltake was also honored to receive a visit from the Vice President of Taiwan, Chen Chien-jen. 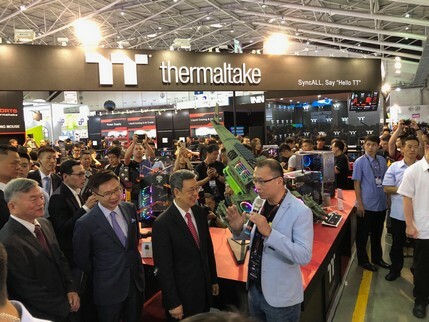 Thermaltake CEO & Chairman, Kenny Lin, introduced Thermaltake’s newest products and impressive casemods to the Vice President of Taiwan. 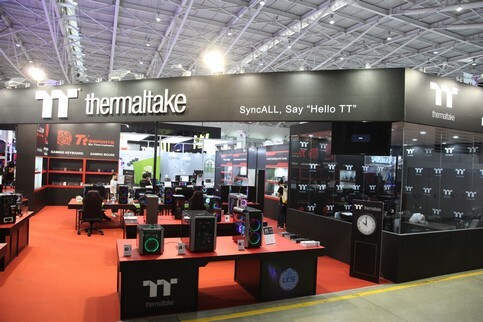 “Today, I am proud to say that Thermaltake is the world’s first to incorporate the latest industry trends of AI technology and Sync technology to computer hardware and gaming peripherals. Therefore our marketing idea for this year is SyncALL, Say “Hello TT”. 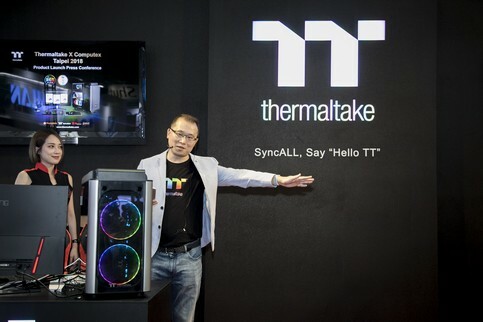 Sync all Thermaltake products together, and Say “Hello TT” through voice control”, said Kenny Lin, Chairman and CEO of Thermaltake. Thermaltake will be live-streaming new product walkthroughs and modder interviews for those who are unable to visit COMPUTEX 2018. Thermaltake live stream will take place on Thermaltake YouTube Channel and Thermaltake Facebook Page from today to June 8th. 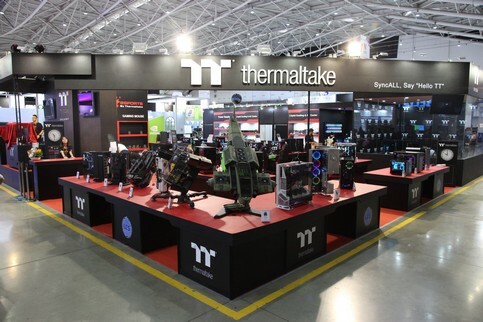 For more information on Thermaltake Group please visit the Thermaltake booth at COMPUTEX Taipei 2018 (Taipei Nangang Exhibition Center, 4th floor, Booth #M120) or visit http://computex2018.thermaltake.com. Designed for celebrating the upcoming 20th anniversary of Thermaltake, the design concept of the Level 20 series chassis is inspired by the vision of creating a functional yet aesthetics gaming chassis for users. Compatible with the latest PC hardware, AIO and DIY liquid cooling solutions, the aluminum-made Level 20 utilizes an aerodynamic trio chamber structure to achieve ventilation and space management optimization. The Three hinged swing-doors are made with premium-quality 4mm thick tempered glass windows that provide durability and superb viewing capability. As to Level 20 GT RGB Edition, it features four 5mm thick tempered glass panels with a swing door design. With high-end complete solution, the chassis supports motherboards up to standard E-ATX and a patent rotational PCI-E bracket design for dual/trio vertical GPU mount. 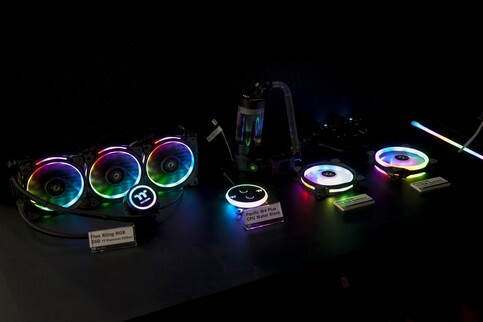 Also on display for the first time at COMPUTEX 2018 are Riing Trio 12 RGB Radiator Fan TT Premium Edition, Pacific CL Series Copper Radiators, Toughpower Grand RGB Gold Series (RGB Sync Edition) Analog Power Supply Units, and Toughpower iRGB PLUS Gold Series – TT Premium Edition Digital Power Supply Units. Other new products at the Thermaltake booth include Pacific M Series D5 Hard Tube Water Cooling Kits, Toughpower GX1 Gold Series Analog Power Supply Units, Tt eSPORTS TT Premium X1 RGB Cherry MX Gaming Keyboard, Tt eSPORTS NEMISIS Switch Optical RGB Gaming Mouse, Tt eSPORTS SHOCK PRO RGB 7.1 Gaming Headset, Tt eSPORTS DRACONEM RGB Touch ID Gaming Mouse Pad and LUXA2 EnerG Bar Notebook Power Series. The world’s top modders from the 2017 Thermaltake Modding Fighting Championships Season 2 are also at the event to present their Core P90 TG mods. 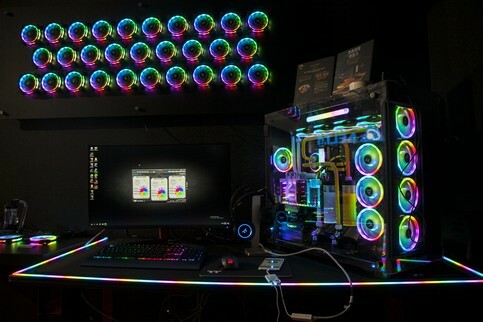 Thermaltake Level 20 Full Tower Chassis, View 71 Tempered Glass Edition Full Tower Chassis, Tt eSPORTS IRIS Optical RGB Gaming Mouse, and Draconem RGB Hard Edition Mouse Pad win the 2018 COMPUTEX d&I Award.